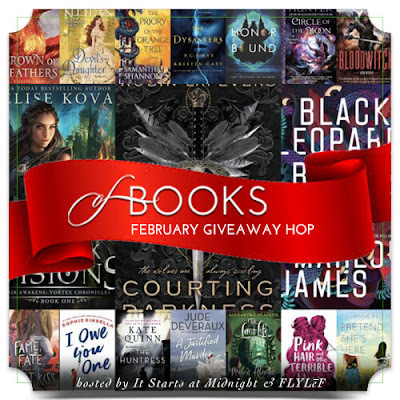 Welcome to my stop on the Of Books February Giveaway Hop hosted by It Starts at Midnight and FLYLēF. Be sure to check out the linky on the bottom of this post to visit other blogs and win more prizes! For my prize, I am giving away $10 worth of books, open internationally. US winners can choose any books or ebooks up to $10 off of Amazon. Everyone else not in the US can pick $10 worth of books off of Book Depository as long as they ship to your country. Good luck! For a chance to win $15 worth of books or eBooks from Amazon or Book Depository, be sure to enter my Romance is in the Air giveaway here. Entrants must be 13+. Please, no cheating. Entries will be verified. All entrants found cheating will be disqualified. Only one person per household may enter. Winner will have 48 hours from the time of winning email sent to reply to email or another winner will be selected. Void where prohibited. I haven't celebrated St. Valentine's Day in years (sniff!). My favourite romantic novel has to be Wuthering Heights. Yes, I celebrate Valentine's Day. We usually go out for a meal. I think I celebrated V Day once years ago! My fave romantic book is Mariana by Susanna Kearsley. My husband & I celebrate by going out to dinner. alone!! We just give each other chocolate and/or flowers for Valentine's Day! We exchange cards and maybe go to a nice dinner or enjoy a nice bottle of wine. We have a new baby daughter this year, so Valentines Day is going to be... no different than ever. We don't really do much for Valentine's anyway, so we will have fun with our daughter! I'm single but Valentines day was never a big thing for me. I'd rather read a book. I celebrate with my granddaughter. No I don't celebrate and I don't have a favorite book. There's to many that I like. I don't celebrate Valentine's Day, I celebrate Galentine's Day, cause if you don't got your friends to love, then you got nothin'! We always go see the latest romcom (this year it's going to be Isn't It Romantic starring Rebel Wilson), and take ourselves out for a boozy, delicious dinner. We always go to a favorite restaurant and have a great romantic meal. I don't usually celebrate Valentine's. A favorite book of mine with romance is Eleanor & Park. I don't celebrate Valentine's Day. It's a Hallmark holiday! Yes, we usually go out to dinner as a family. I celebrate it by eating a bar of chocolate. I'm a manager in retail so I'm usually at work on Valentine's Day! But my husband and I do make a point to do a date night either the weekend before or the weekend after and get dinner and a movie! We order take out with our daughters to avoid the crowded restaurants, and then go on a date the following weekend. We don't really celebrate Valentine's Day, other than getting the kids valentines to exchange at school. I always celebrate Valentine's Day with my husband. We normally go out for a nice dinner and then go home and watch a romantic movie together. No we don't really celebrate. My husband and I always go to a movie on Valentine's Day. We celebrate Valentine’s Day by going out to dinner. We celebrate with a relaxing dinner at home. We had a nice dinner at home this year.